Thursdays, 11 - 3 p.m.
Fridays, 1 - 4 p.m. The Jubilee Quilt Circle provides opportunities to share stories, memories, traditions and values as well as skills with interested people of all ages. The Community Artists’ Collective invites you to learn or work on quilting, knitting, crochet and embroidering. Supplies provided. Workshops and demonstrations offered at The Collective, 4101 San Jacinto, Suite 116. Contact The Collective at 713-523-1616. The Jubilee Quilt Circle provides opportunities to share stories, memories, traditions and values as well as skills with interested people of all ages. Historically quilting has provided community strengthening and social times for the participants as they engaged in the practical endeavors of planning and making a functional and beautiful quilt for a family. The ritual act of giving the quilt to a young woman of the community was a way of expressing a value for family and supporting the young couple as they were about to marry and begin their family. 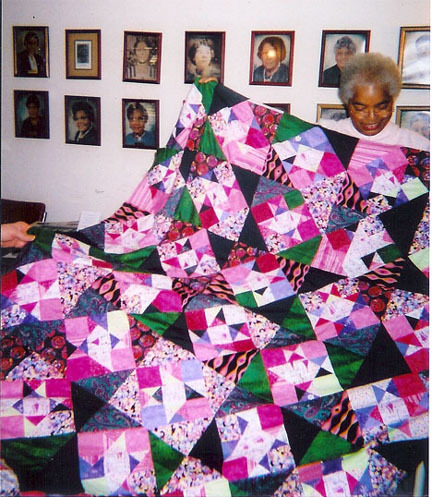 The quilt was a symbol of what she had learned and was committed to sharing with another generation. In these contemporary times, The Jubilee Quilt Circle honors the traditions of our past while encouraging personal growth opportunities and experiences in Houston, Texas. We offer educational and other services through informal conversations, formalized classes, workshops, presentations, and displays of contemporary and antique quilts. We also offer advice and other assistance to repair and finish family treasures or help you to create the quilt of your dreams. We invite you to share some time and laughter as we remember the love that transcends geography and generations through quilting. You are encouraged to bring and allow your quilts to be photographed. Show us your photographs of the quilters in your life. Share your memories and stories with generations yet unborn through videography and other technology. These important documents will become part of an archive of the African American historical/cultural community because of your participation. The Community Artists’ Collective is funded in part by a grant from the City of Houston through the Houston Arts Alliance. The Community Artists’ Collective is a member of FreshArts Coalition. Visitors from The Riley/Barrett Station Sewing Club 4/7/2016 and the children from SHAPE Community Center enjoy learning about and producing their own projects. 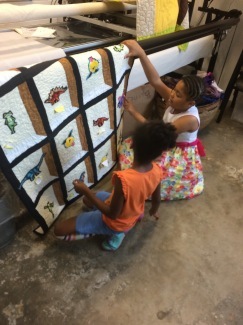 Here they admire a recently completed quilt project coordinated by their instructor, Leslie Abrams.